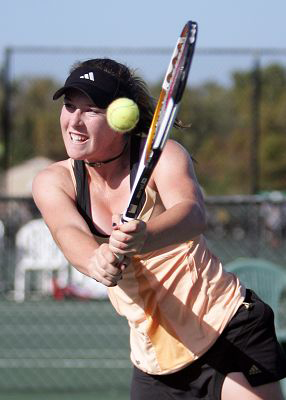 As a junior player in Delaware, Madison Brengle was a dominating force on the courts. An Easter Bowl champ who reached the 2007 Australian Open girls’ singles final, Brengle now trains full time at the IMG Academy in Bradenton, Fla.
Middle States caught up with the No. 182-ranked Brengle to see how her training and progress has gone recently. Middle States: It seems like this year is moving pretty quickly and it’s about to be very busy for you, travel-wise. How have the past few months gone and what have you been working on from a training standpoint? Madison Brengle: I had a really good offseason. I train at IMG right now and I’ve been working really, really hard. It’s paying off because I’m playing well right now. MS: What have you worked on specifically, and where are your biggest improvements? MB: My serve has gotten so much better, even in the past few weeks. That has been a big focus of mine. Other than that I really worked on fitness and overall speed; trying to get faster and being more aggressive. My big thing, though, was getting a more aggressive and consistent serve and not giving up any double-faults. MS: What type of schedule do you have over the next few months? Is it pretty hectic? MB: It is. I travel a lot, and when I do that, I’m kind of on my own. You have to be really self-aware and realize what needs to get better. When I get back to IMG I try to focus on that. I’ve lived in Florida for three and a half years right now. I’m enjoying everything. I’ll probably be around the US for the next few months and then I’ll start playing some clay tournaments and getting ready to go to Europe. MS: What is your favorite time of year? MB: I love the grass court season. It’s different and a change up — I just love playing on that surface. I really like being in England a lot, too. MS: When you’re on the road, in different countries and around the US, do you get a chance to enjoy the area at all? MB: Well, that is tough. It’s a little bit sad because most trips you go from hotel to courts, to hotel, back to courts. I do get a chance to enjoy it a little bit, though. And my friends and I try to squeeze a lot into a month or so. We train during the day and try to find time to spend time with one another going to football games, concerts — things like that. MS: What do you see happening in your career over the next year? MB: I’m definitely excited. I feel really good about everything right now. But I’m trying to take things one at a time and strike a balance. I want to go one match at a time and focus on improving. I’ve made a lot of strides in the past few weeks and I’m looking forward to getting even better as we move along.